For nearly a third of Newark's 333-year existence, the Newark Museum has been a major presence in its educational, intellectual and cultural affairs. With a strong network of arts and educational institutions, Newark, historically a mercantile center, has become a major American cultural and intellectual center as well. At the core of its stellar collection of agencies is the Newark Museum, which is marking its 90th anniversary. The Newark Museum's story begins in 1889 with the founding of the Newark Public Library. Its second director, John Cotton Dana, was the nation's best-known and most-respected public librarian. After heading the public libraries in Denver and Springfield, Massachusetts, Dana came to Newark in 1902, where he spent the remainder of his life serving concurrently as director of the library and the museum. He was one of the nation's greatest authorities in both fields. The museum's early exhibits included an annual painting exhibition, organized in 1903 by Msgr. George Washington Doane. In 1905, Dr. William J. Disbrow held a display from his enormous natural history collection. Early in its history, it began lending boxes of materials to the Newark schools. As the demand for more three-dimensional materials grew, the need for a museum arose. The city into which the new Newark Museum was born in 1909 had a population of 283,000 and was preparing for its first cultural renaissance of the 20th century under the dynamic Mayor, Thomas L. Raymond (1915-1918, 1925-1928). At the same time, dozens of agencies were created to meet the needs of the growing metropolis, which was then predominantly German, Italian and Irish, as well as African-American and Jewish-American. Churches, temples, restaurants, theaters and department stores drew people from all over Northern New Jersey to town on pleasure and business. 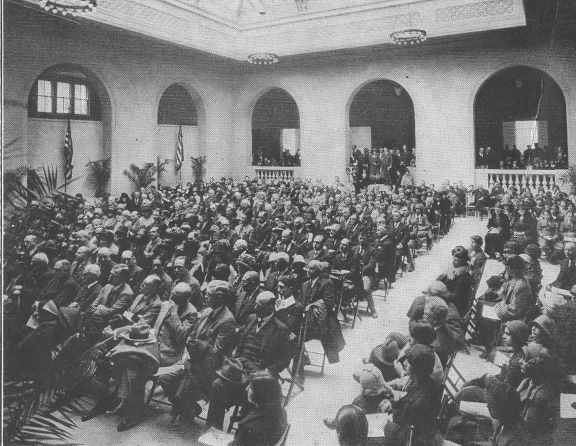 The Newark Museum was created in 1909 when Louis Bamberger and 49 leading citizens, including Franklin Murphy, Christian Feigenspan, Moses Plaut, Marcus L. Ward and Dana, drew up the charter and by-laws for the establishment of The Newark Museum Association. Its main role was the reception and exhibition of articles of art, and sciences. In 1911, Dana convinced the City of Newark to purchase the George T. Rockwell Collection of 3,000 Japanese objects with public funds, the only time the museum used city money for collection acquisition. Between February and June of that year, 150 Tibetan objects were lent by Dr. Albert L. Shelton for exhibit. The response was astounding. The Tibetan Collection was presented to the museum later that year in memory of Trustee Edward N. Crane who had befriended Shelton. This formed the basis for the largest such collection in the Western hemisphere, one that has won the Newark Museum worldwide recognition. Dana's interest in the arts of daily life resulted in pioneering exhibitions such as German Applied Arts (1911) and New Jersey Clay Products (1915). The German show was the first museum exhibition of industrial art. New Jersey Clay Products showcased one of the state's largest and most important industries. These two shows demonstrated not only educational experience but an outstanding example of outreach to local business and industry. Dana also pioneered the display works of neglected, underrated and local artists such as Childe Hassam, Max Weber, John Marin and Stuart Davis. The museum was America's first to hold an exhibition showing the work of living artist Max Weber in 1913. Weber praised Dana for showing his works at a time when only French salons accepted them. This helped establish the museum's strong commitment to modern art. Works of American artists, row after row of Oriental treasures, a children's exhibition and a great leather industry display, including Newark-made products and leather boots of sixteenth-century French knights, impressed the vast and excited crowd. Notable early exhibitions included those in 1928 and 1929 entitled Inexpensive Articles of Good Design items selected from the five and dime store, American Primitive Painting (1930) and American Folk Sculpture (1931), the first American museum showings of folk and popular art. If anyone were to select a single word to describe the goals, purposes and functions of the museum, the word would be 'education.' This mission has been honored over nine decades with the assemblage of great collections and through mounting impressive exhibitions and implementing creative programs. The museum's educational efforts have been so successful other American museums often looked to Newark for leadership as well as innovation. In 1912, Dana established the Educational Loan Collection. The Junior Museum followed suit in 1913. Dana and Bamberger also expressed interest in a planetarium for Newark. Finally, in 1952, the Alice and Leonard Dreyfuss Planetarium became a reality. Today, the Newark Museum's Education Department serves more than 315,000 children and adults and is the 11th largest education department of the nation's 151 leading art museums. Dana died in July 1929 after returning from a trip to Cairo. He was succeeded as director by Beatrice Winser, a formidable keeper of the flame, Alice Kendall and Katherine Coffey. Winser's considerable contributions to the museum included keeping the institution afloat during the Great Depression and World War II. In doing so, she strengthened the curatorial departments and brought the institution into every facet of daily life of a modern city. Samuel C. Miller came to Newark from the Albright-Knox Art Gallery in Buffalo in 1967. The trustees had long envisioned a plan for a new museum complex. Soon after Miller's appointment as director, he met Princeton architect Michael Graves, with whom he was professionally associated for the next 25 years. The original Graves museum expansion was not realized in light of the national riots of 1967 and the City's budget crisis in 1969. However, the addition of new collections and important gifts and the installation of important exhibitions pushed the goal and demand for larger facilities. Important exhibitions of the period included Art of Africa in 1969 and Whaling Days in New Jersey and Making Movies in New Jersey, 1976. In 1978, two important exhibitions attracted national attention, Geometric Abstraction and Murals Without Walls. The latter unveiled two remaining panels of Arshile Gorky's Newark Airport murals after 30 years of oblivion. The installation, In Praise of Heroes: Contemporary African Commemorative Cloth, was a pioneering show of these materials in 1982. At this point the trustees began broadening the museum's base of operating support. Reflecting the wide scope of its educational activities, its significance as a cultural beacon, and its role in community-building, the State joined the city in 1969 to pledge their support of an annual operating budget. In 1976, with support from City Capital Project and private donors, the museum's Ballantine House was restored and designated a National Historic Landmark.